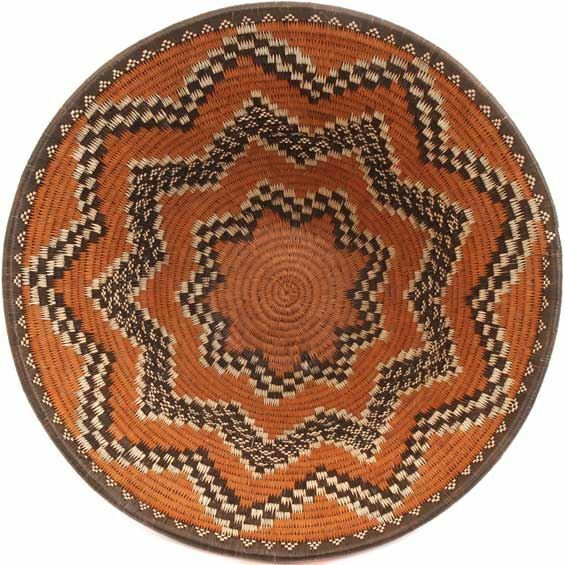 This Masterweave African basket represents some of highest quality baskets woven today. Use this piece to add a touch of organic, natural beauty to your décor. These Botswana baskets, representing some of the highest quality baskets woven today, spring from the people living in earth’s largest inland delta. Created from the Okavango river, which spills into the sands of the Kalahari Desert instead of the ocean, the delta contains one of the continent’s most diverse and abundant populations of animals. Women of the Bayei and Hambukushu tribal groups painstakingly create this art from "mokola" palm tree fiber coil-woven around grass or vine. The bark and roots from two different trees are used to make the dye colors, as are decomposing sorghum husks and the leaves of a special shrub. Traditionally, these beautiful decorative open bowls are used by women for winnowing grain or carrying things on their heads. Lidded baskets would be used for grain storage or for holding sorghum beer. Time taken to weave a larger art basket is often measured in months or even years. Pricing is according to the weaving quality and size of the basket. Two baskets the same size, but with different weave qualities will be priced differently according to the quality of the weaving.